‹b, d, f, h, k, l and t›. Note that ‹t› is not as tall as the other tall letters. ‹f, g, j, p, q and y›. 2. Most letters go down towards the line first: ‹b, h, i, j, k, l, m, n, p, r, t, u, v, w, x, y and f ›. Note that ‹f › arcs backwards a little before it goes down. 3. The following letters start like a ‹c›: ‹a, d, o, g, q›. These are referred to as the ‘half circle or caterpiller c’ letters. The ‹s› also starts like a ‹c›, but curves around like a snake. 4. 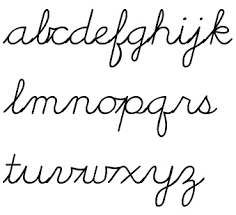 The formation of the letters ‹z› and ‹e› starts with a horizontal left-to-right line. Note that the ‹e› starts lower than the other letters and comes back over like a ‹c›. 5. The children should be told that the letters in a word are written close together, but without bumping. Children should also be told to leave a space between words. It is important to revise the formation of each letter regularly. When the children are writing, it is a good idea to check the pencil hold and make sure the letter formation is correct.